This smooth finish black cardstock folder is stamped with a gold rose design. Optional custom imprinting available. These Gold Rose Event Photo Folders are perfect for prom & homecoming school dances, anniversaries, balls, Valentine's Day events & more. Cardboard photo folder is designed to be used as is, or personalized with custom imprinting to advertise your company or event. 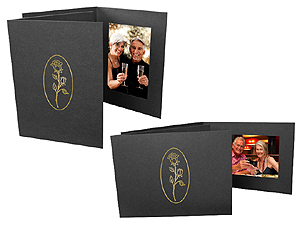 We use our standard black photo event folder and then accent it with our Rose design in Gold foil. The design is hot stamped (imprinted) right onto the front of the folder.